First of all, a big thanks to the readers, friends and visitors for your continuous support. My blog has crossed 7 lakh hits. Most of the recipes are traditional, and here comes an authentic recipe from my mom and grandma. Thanks amma and paatti. I can remember our childhood days, when we assist the elders in spreading the vadaam on the terrace, driving away the crows and simultaneously eating the half dried vadaams which we call as "araikachal vadaam". The araikachal vadaam has a unique taste and most of the vadaam goes into our stomach half dried defeating the purpose of getting stored in the pantry for a year. Many readers has been asking me to post koozh vadaam. Eventhough I have learnt to make koozh vadaam from my mom, she takes pain and makes for all of us for the whole year and packs it for us. She does it with great interest and says the pain is worth the gain. Coimbatoreans start making vadaam and vathals on the month of February as summer starts on February and wind start on March. As usual, this time also my mom has packed and gave me a full set of vadaams : Two types of koozh vathal, ela vadaam and kozhambu vadaam. I wanted to post the recipe with stepwise pictures. It is because of this reason, I am unable to post stepwise. All I did is to arrange them and take a snap of it. However, the recipe is an authentic one from my mom and grandmother. I have typed as narrated by her. You can try a lesser quantity with the corresponding proportions. KOOZH VADAAM - TYPE 1. Green chillies - 100 gm. Water - quantity is mentioned in the recipe. 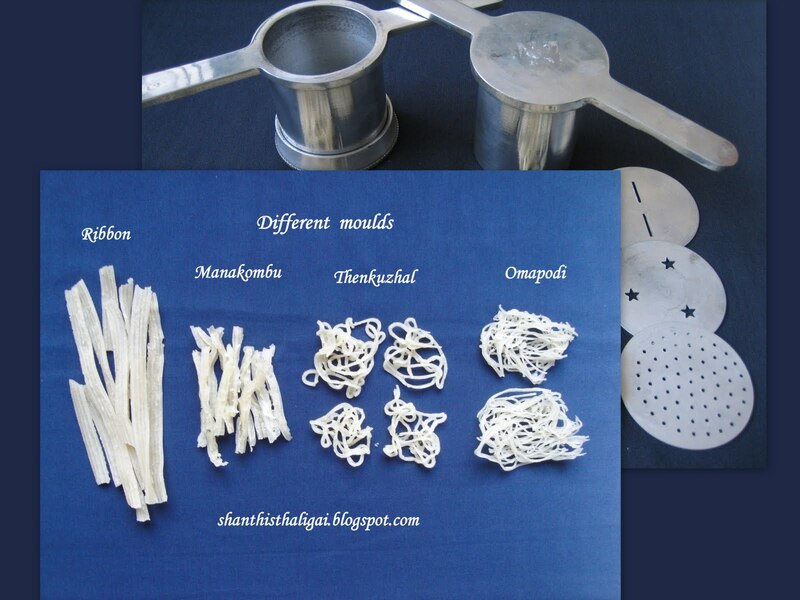 Murukku press with different type of holes. Grind green chillies, salt and hing to a fine paste with a cup of water. Strain and keep the juice ready. Wash javvarisi and soak in water for 2 hrs. After 2 hrs. Crush the javvarisi with your hands. Take water in the pressure cooker. NOTE: Water should be a little less than 3/4th of the cooker. When adding javvarisi alongwith soaked water and chilly, salt juice, the water level should be 3/4 th of the cooker. Bring it to a boil. Now add the crushed javvarisi alongwith the soaked water to it and allow it to cook till transparent. Now add the green chilli, salt juice. When it starts boiling simmer the stove and add the rice flour little by little, preferably a cup at a time and stir continuosly without any lumps till it forms a sticky dough. Keep this dough covered with the lid and when cool, add the lemon juice and mix well. This is the koozh maavu(sticky dough). Transfer to a wide stainless steel vessel. (NOTE:This is important to avoid chemical changes), cover and leave it to cool overnight. The next day, early in the morning, spread the plastic sheet on the terrace, keep weight on all sides, to prevent the sheet flying in the air. Wet your hands, fill the mould (achu of your choice) with the koozh and press evenly on the plastic sheet. Dry it in hot sun for 3 days, store in airtight containers. Vadaam is ready to be stored for a year. Deep fry in oil as and when required. On the third day, add some water to it and make a batter as of dosa batter. Other procedures are same as Type 1 and here we are pouring the batter instead of rice flour. This TYPE 2 vadaam will not be as white as TYPE 1 vadaam. It will be slightly red in colour when deep fried in oil. The maavu will take longer time to cool. So, prepare it the previous day night. If you press and spread when the maavu is hot, the vadaam will become red while frying. So make sure the maavu is cool. Start pressing the vadaams early in the morning avoiding hot sun. Hot sun is harmful for us and causes dehydration, tiredness and sunstroke. Hot sun is very good for the vadaam though. Love this. And congratulations on the 7 lakh hits and more! wow!!!!!!! !i love to have this...congrats on the no. of hits,thats awesome! Thanks for sharing this traditional recipe..
looks fab! I remember my mom used to make them and we as kids used to sneak the raw maavu and gobble them when mom wasn't looking :) your recipe is a keeper. Awesome! Truly a sun special entity..loved the efforts u have put up in these n sure a keeper,bookmarking these!! Perfect time to do this vadam. Thanks for sharing this wonderful recipe. wow! Congrats on the number of hits... we all love the authentic dishes like this one... yummy! I also used to make this in India with my mom and sister in hot summer months. for the whole year, we would have the supply of all fryables...thanks for visiting my blog Shanti..
thanks shanthi for the lovely words on my space. reading this post, reminds me of my mother making the rice and sago papads. i know these traditional recipes take a such a long time to make. i remember the way my mom would doing everything so patiently and carefully. long awaited recipe..viewed it late..will surely try next summer! !